A few months ago, the writing of Vapoteurs.net in collaboration with the site Ecigintelligence offered to answer an inquiry whose purpose was to understand the use of electronic cigarettes among French vapers. Today, we reveal the results of this one. The purpose of this survey, which was to understand the use of electronic cigarettes among French vapoteurs, took place between the month of September and the month ofOctober 2017. - It was organized by the platform Ecigintelligence in collaboration with the French news site Vapoteurs.net. - No financial compensation has been proposed for participation in this survey. - The results of the survey are based on the responses of a panel of 471 participants. - The questionnaire used for the survey was hosted on the platform Survey Monkey". Most of the people who responded to the survey are ex-smokers who have been using the cigarette for at least two years. A large portion are older men between 25 and 44 who smoked more than 20 rolled cigarettes and who today use open and sophisticated spray systems. More than half of the participants report that the main reason they switched to vaping is stopping smoking. The vape shops are very popular in France especially for the purchase of e-liquids. In contrast to this, participants often prefer to order the material directly on the internet. French consumers are not ashamed to say that they are suspicious of the tobacco industry. A large percentage of respondents mix their e-liquids themselves. It is the bottles of 10 ml that are most often purchased when it comes to e-liquid "ready to vaper". The most popular type of e-liquid in France is "Fruity" and the nicotine level is usually "low". The French market seems to favor sophisticated equipment and it is the "open" systems that are dominant. Participants often started on novice material before switching to advanced and "open" systems. The gender analysis reveals that women are less inclined to replace their vapers. In addition, they are more interested in the ease of use and appearance of the material than men. We found that positive feedback, curiosity and seeing other people try are the three things that motivated participants to go into vaping. 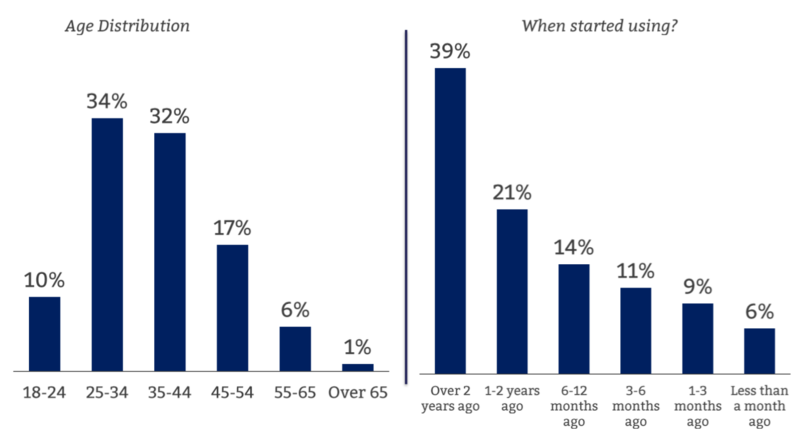 Among the survey participants, 80% have between 25 and 44 years old and are experienced vapers: Most of them have been using the electronic cigarette for more than 2 years. - 89% of participants are ex-smokers, only 10% of participants who reported being smokers and 1% who never smoked. 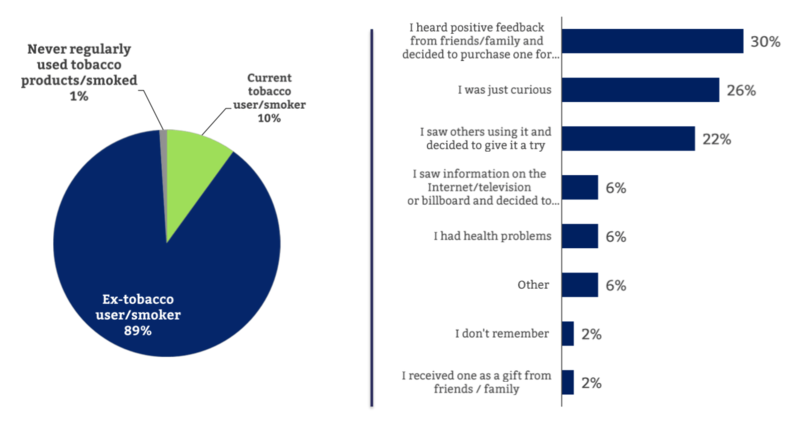 - Motivations to embark on the vaping: For 33% of the participants it is the positive return of the relatives, for 26% it is the curiosity, for 22% it is the fact to have seen people using a cigarette electronic. Advanced vaping equipment is predominant in participants. 95% of them report using advanced and "open" systems against 1% for cigalikes. Of those who use a second e-cigarette, 66% report using it every day. - More than 60% of participants say they do their own e-liquid. 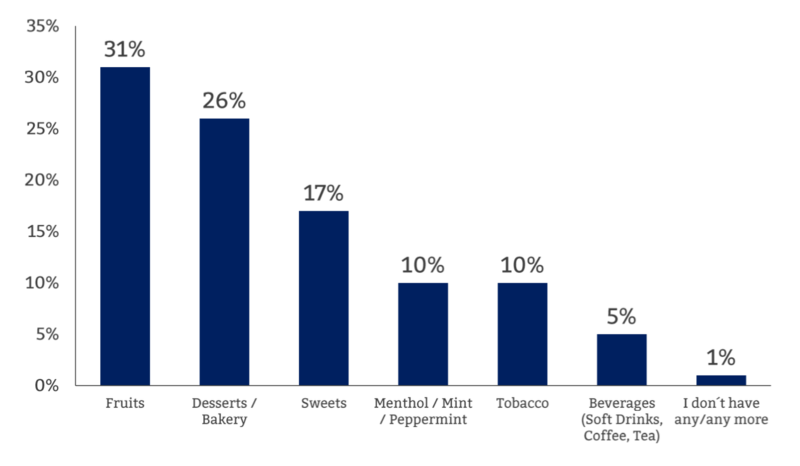 - "Fruity" flavors are the most popular (31%). Behind, we find desserts and cakes (26%) and greedy (17%). - Physical and online vape shops are the most popular distribution channels. - Very few participants say that they buy their products in non-specialized shops which also have a rather bad image. - For 25% of participants, it is not practical to shop there. - For 16%, products are not always available. - 16% declare that what the desired products are not available. - 25% say they do not have one near their home. 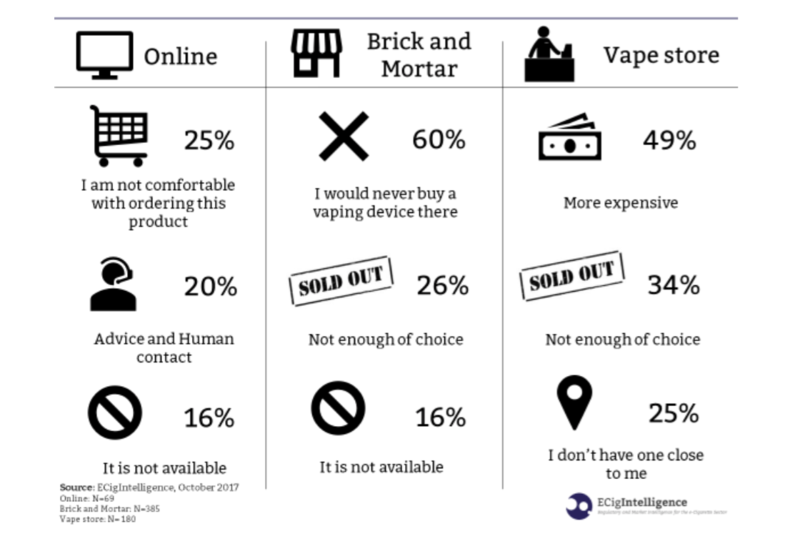 E-CIGARETTE: Result of the survey conducted on ... Last April, ECigIntelligence, an independent market research firm specializing in the vape sector, launched a major survey of electronic cigarette shops in the United States.